We all know portraits can be made of ancestors, but can a portrait be an ancestor? In Te Ao Māori, the Māori world, they can. Paintings like this one—and even photographs—do two important things. They record likenesses and bring ancestral presence into the world of the living. In other words, this portrait is not merely a representation of Tamati Waka Nene, it can be an embodiment of him. Portraits and other taonga tuku iho (treasures passed down from the ancestors) are treated with great care and reverence. After a person has died their portrait may be hung on the walls of family homes and in the wharenui (the central building of a community center), to be spoken to, wept over, and cherished by people with genealogical connections to them. Even when portraits like this one, kept in the collection of the Auckland Art Gallery, are absent from their families, the stories woven around them keep them alive and present. Auckland Art Gallery acknowledges these living links through its relationships with descendants of those whose portraits it cares for. The Gallery seeks their advice when asked for permission to reproduce such portraits. This portrait has been published in the Google Art Project, which is why we can look at it here. Māori are the indigenous people of New Zealand. The subject of this portrait, Tamati Waka Nene, was a Rangatira or chief of the Ngāti Hao people in Hokianga, of the Ngāpuhi iwi or tribe, and an important war leader. He was probably born in the 1780s, and died in 1871. He lived through a time of rapid change in New Zealand, when the first British missionaries and settlers were arriving and changing the Māori world forever. An astute leader and businessman, Nene exemplified the types of changes that were occurring when he converted to the Wesleyan faith and was baptised in 1839, choosing to be named Tamati Waka after Thomas Walker, who was an English merchant patron of the Church Missionary Society. He was revered throughout his life as a man with great mana or personal efficacy. What is Wesleyanism? In his portrait, Nene wears a kahu kiwi, a fine cloak covered in kiwi feathers, and an earring of greenstone or pounamu. Both of these are prestigious taonga or treasures. He is holding a hand weapon known as a tewhatewha, which has feathers adorning its blade and a finely carved hand grip with an abalone or paua eye (image above). All of these mark him as man of mana or personal efficacy and status. But perhaps the most striking feature for an international audience is his intricate facial tattoo, called moko. Lindauer was a Czech artist who arrived in New Zealand in 1873 after a decade of painting professionally in Europe. He had studied at the Academy of Fine Art in Vienna from 1855 to 1861, and learned painting techniques rooted in Renaissance naturalism. When he left the Academy he began working as a portrait painter, and established his own portrait studio in 1864. Just ten years later he arrived in New Zealand and quickly became acquainted with a man called Henry Partridge who became his patron. Partridge commissioned Lindauer to paint portraits of well-known Māori, and three years later, in 1877, Lindauer held an exhibition in Wellington. The exhibition was important because it demonstrated Lindauer’s abilities and he was soon being commissioned by Māori chiefs to paint their portraits. Lindauer took different approaches to his commissions depending on who was paying. He tended to paint well-known Māori in Māori clothing for European purchasers, but painted unknown Māori in everyday European clothing when commissioned by their families to do so. His paintings are realistic, convincingly three-dimensional, and play beautifully with the contrast between light and shadow, causing his subjects to glow against their dark backgrounds. As his patron, Partridge amassed a large collection of portraits as well as large scale depictions that re-enacted Māori ways of life that were thought to be disappearing. In 1915, Partridge gave his collection of 62 portraits to the Auckland Art Gallery—the largest collection of Lindauer paintings in the world. If you’ve been paying attention to dates you will have noticed that Nene died in 1871 but Lindauer didn’t arrive in New Zealand until 1873, and didn’t paint his portrait until 1890. 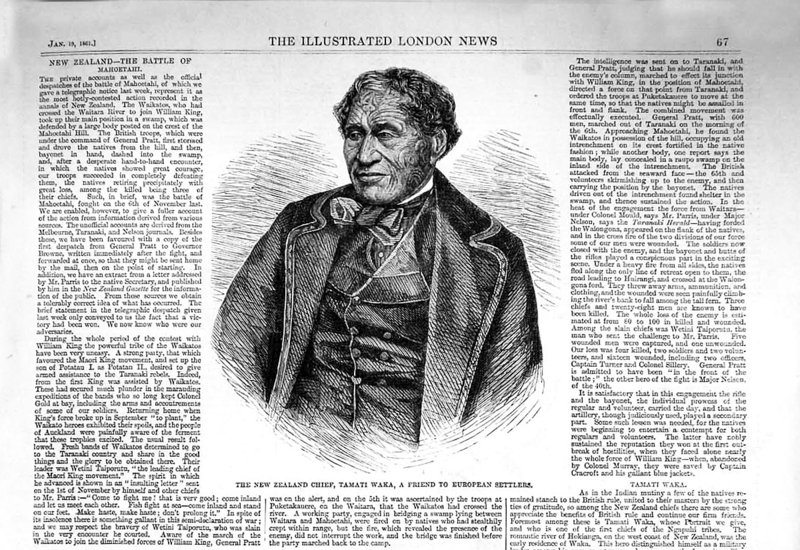 It is likely that Lindauer based this portrait on a photograph taken by John Crombie, who had been commissioned to produce 12 photographic portraits of Māori chiefs for The London Illustrated News (image above). There are several other photographs of Nene, and in 1934 Charles F Goldie—another famous portrayer of Māori—painted yet another portrait of him from a photograph. So Nene didn’t sit for either of his famous painted portraits, but clearly sat for photographic portraits in the later years of his life. These were becoming more common by 1870, due to developments in photographic methods that made the whole process easier and cheaper. Many Māori had their portraits taken photographically and produced as a carte de visite, roughly the size of a playing card, and some had larger, postcard sized images made, called cabinet portraits. Lindauer is thought to have used a device called an epidiascope to enlarge and project small photographs such as these so he could paint them. Lindauer didn’t make many sketches. He worked straight onto stretched canvas, outlining his subjects in pencil over a white background before applying translucent paints and glazes. Through the thinly painted surface of some of his works you can still see traces of pencil lines that may be evidence of his practice of outlining projected images. But Lindauer wasn’t simply copying photographs. In the 1870s, color photography had yet to be invented—Lindauer was working from black and white images and reimagining them in color. Moreover, sometimes he dressed his sitters—and those he painted from photos—in borrowed garments and adorned them with taonga that were not necessarily theirs. Thus some of his works contain artistic interventions rather than being entirely documentary. Cite this page as: Dr. Billie Lythberg, "Gottfried Lindauer, Tamati Waka Nene," in Smarthistory, November 28, 2015, accessed April 23, 2019, https://smarthistory.org/gottfried-lindauer-tamati-waka-nene/.